I'm delighted to hear it, and I'm happy to share more with you that came pouring in after our last round in March. Keep 'em coming! Send me their info directly if you'd like (cyndi @ mazeltovjewelry.com - remove the spaces) or leave a comment below. Oh, and send pictures! You know we love pictures here! This is my go to bead store when I need a fix. 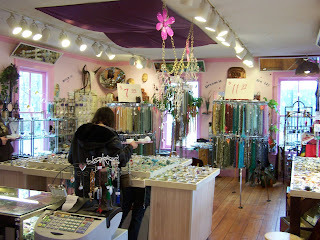 They have every semi precious gemstone you could want and are THE most friendly helpful bead store owners I have EVER had the experience to know. WEBS, America's Bead Store in Northampton, MA, little sister to the legendary WEBS yarn warehouse. I was so glad when they opened the bead shop 3-ish years ago. Each year, it gets better and better. It's packed to the brim with selection and you can buy lots of single beads which my daughter and I really appreciate. Our favorite bead store is in East Rochester, NY. It's called Let's Bead! They have the latest & greatest styles and are always getting in the highest quality beads available. They also have some of the most talented jewelry designers working there and teaching classes. I'd like to add Crystal Bead Bazaar in Pittsburgh, PA. Great owner and staff. Always helpful and supportive. I have a tiny little bead store called Bead Soup in an old converted cotton mill called Savage Mill. It is located in Savage, Maryland. I love seed bead stitching so I have cornered the market on size 15/0's. We are starting to get into bead embroidery and needle felting. I have a collection of whimsical items such as MyElements which is a collection of hand painted acrylic compenents, Bead Me A Story which has flexible bugle beads made out of polymer clay and needle felted animals that are as cute as can be. There are lots of classes being offered, many in Japanese designs, anything spirals and bezeling inside of pendants.